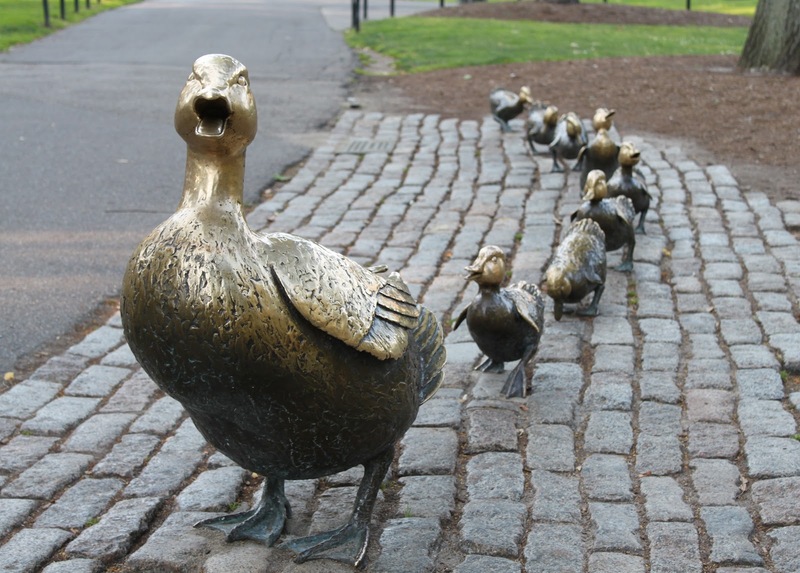 Historic Boston Traffic Jam Caused By Ducks… Yes, Ducks. BOSTON – If you were caught up in yesterday’s little traffic tie-up, you were probably wondering if there was a water main break, a Bruins parade, a record snowfall, bridge painting, a train accident, and conventions for both political parties all at the same time. Or maybe it was the Friday of July 4th and you didn’t know it. But in truth, it came down to none of that. The whole thing was caused by a few ducks. Around 7:20 in the morning, Storrow Drive’s six lanes were blocked in both directions by a family of ducks making a crossing. This came after the ducks stood on the curb loudly quacking, startling drivers from their iPhones long enough to lay on the horn. Bystanders first reported the commotion near the Hatch Shell, and finally lone beat cop Michael McMinehan took it upon himself to hold traffic for around three minutes while the ducks waddled toward Mt. Vernon Street. But that, as they say, was just the beginning. The short backup soon extended beyond Leverett Circle and gridlocked the West End, causing traffic on both decks of I-93 to slow to a crawl. This became a parking lot in the tunnels, the Tobin, the Southeast Expressway and of course, the Mass Pike. The citywide congestion calamity lasted well into the evening. If you thought the surface roads were safe, think again. As the critters made their way through the city, they continued to interfere with pedestrians, commercial establishments and delivery and construction crews. Boston Police department dispatcher Margaret Clancy was forced to dispatch officers to Beacon Street to block the intersection with Charles, allowing the animals to enter the Public Garden. This caused gridlock throughout the Back Bay that lasted several hours. So look for that bill to come later, Bostonians. The incident even made the national news. On CNN, coverage steered away from a missing radio-controlled plane owned by a ten year old in Minnesota, to the unfolding traffic nightmare in Boston. Wolf Blitzer mused, “Could these ducks be receiving signals, maybe something we can’t hear, from outer space of something, causing them to act this way?” while talking to a dumbfounded representative from the Audubon Society. Dr. Phil would also like to know, “If it turns out that for the dad to just run off for a whole week while mom has to herd the kids across a deadly obstacle course is a normal duck thing, I’ll take it back, but this seems like a passive-aggressive form of abuse or worse, maybe even purposeful and murderous.” He is reportedly trying to book the ducks for an upcoming episode. On Fox News, the situation was cause for national security concerns. “If we find out that ISIS has sent these ducks, and maybe others, to infiltrate our cities, I can’t imagine the fallout for the White House here,” opined Laura Ingraham. Rush Limbaugh had other culprits in mind, “The tree huggers are just beside themselves with glee, my friends, and I’m telling you, they’re shipping in crates of critters. I call them Animal Qaeda.” PETA was unavailable for comment. On A&E, producers are already planning a reality series about the ducks to air this fall, to replace the faltering Duck Dynasty. Not for nothing, Mr. President, but yesterday was not a day drivers in Boston will remember with sharing in mind. Unless we’re sharing a plate of roast duck. This entry was posted in Childs' Play and tagged boston ducks, boston gridlock, boston highways, boston roads, boston traffic, bottleneck, ducks in boston, gridlock, traffic jam by Tom Bishop. Bookmark the permalink.